Are you the traditional type of guy/girl? Do you still believe in all the good things your mamma told you about when growing up? If so, you probably know that the cutting board that will be always kind to your knives, not dulling them quickly is the wood cutting board. With its natural anti-bacterial properties, the wood cutting board is also self-healing, shallow cuts will close up on their own. We know that some will steal their thunder as bacteria can multiply in deep cuts. But, sit on your backs and relax: latest studies have shown that eventually these bacteria die off, so that’s a great thing, right? Our top 5 is here! Yes, that’s right, folks! Bamboo is actually a type of grass; it’s sure that some species are as hard and resistant as wood, but, as in matter of fact, bamboo is not a kind of wood. 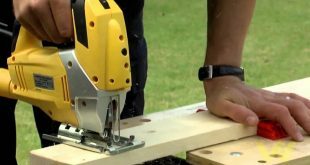 If you are determined to buy a wood cutting board, keep in mind to look for a tight-grained hardwood (to avoid the deep knife cuts), made without fillers, stains or harmful chemicals. 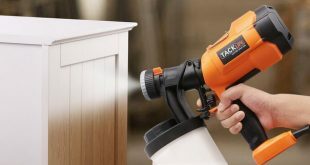 Once you got one, don’t forget to constantly oil it with food-grade mineral oil; this will protect your wood cutting board from stains and warping. If you want your wooden product to last for years, remember not to put it in the dishwasher. Not even once. If you want to only buy once a cutting board, do not hesitate to spend your money for this resistant, durable and nice looking cutting board. 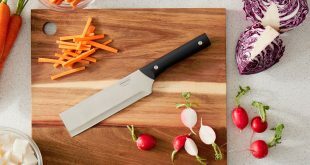 The acacia used for this cutting board will not only take care of your knives and pocket, but it will also surprise you with its colors. Acacia is a hardwood that range its colors from gold to chocolate brown, with beautiful, contrasting patterns. The wood will luster and change its color in various lighting conditions. 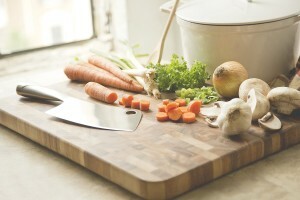 The cutting board is easy to wash in warm, soapy water and rinse properly with clean water. 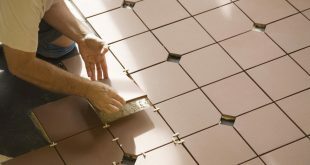 You will not have to soak it and in order to dry it, you just have to put it on the counter, allowing all surfaces to air dry. 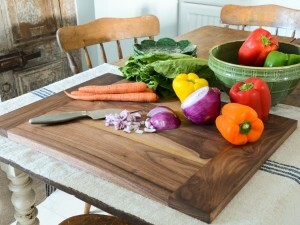 If you want to have this wood cutting board for a very long time, please note to rejuvenate, protect the wood by rubbing it with some oil (there are so many out there). The oil will prevent the cracking and will take good care of the natural colors of the wood. The large surface of this cutting board, the end grain construction, adding strength to the product should convince you to buy it already. And for your friends also, since it ships gift-wrapped when in need! The highest quality Indian Sheesham wood used for this product is not only recommend it as a good cutting board, but also as a nice, elegant enough option for serving food. The unique marble grains (there are no 2 boards alike) will make you feel special, for sure. 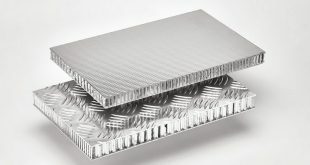 You can chop whatever you want on this cutting board; it is extremely durable and has a natural resistance to bacteria. You do not have to worry about this cutting board slipping around; it has non slip corner feet that will keep the board secure. 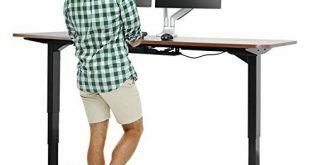 You will be surprised to find out that these feet are permanently secured inside the wood without glue, through a patented process. Most of the customers were happy about this products even years later. The only concern when cleaning it is to keep it away from the dishwasher and only hand wash it in need. And, if you want to spread the good news around, feel free to order one for your friends also; it may be delivered as a gift also. Made from edge-grain plantation teak, this 20-inch cutting board will be a nice support in your cooking for a very long time. The versatility, the beauty and function of the teak, this products was made using responsible forestry practices. If you care enough for our planet, do not hesitate to buy this product; only remnants from other teak products discarded during manufacturing were used when making this product. With a classic design, this product will not slip, nor crack as long as you keep in mind to use mineral oil in the beginning and constantly after the first 10 days. It will mean the world to its appearance and durability! 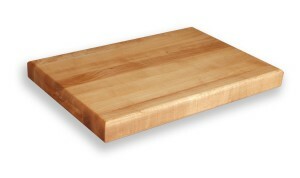 When in need for a durable, functional and low priced wood cutting board, keep in mind this product also. Made from maple, this cutting board will not only allow you to cut even the bones on it, but also make your kitchen counter look nicer. This is a reversible cutting board, so you will be able to chop either veggies or meat, thus eliminating the cross-contamination problems. Thick, with a mineral oil finish, this cutting board will be a stable and long lasting cooking support for you, even if you cook as a daily job. 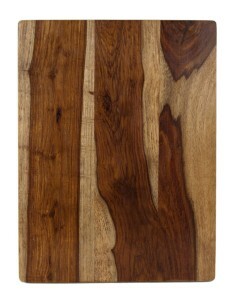 Take a deep breath and take a look at this last (but not least) cutting board. 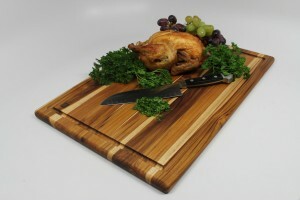 Made from solid maple wood, this cutting board has a natural oil finish and will last for a very long time, as long as you take good care of it. This cutting board is reversible, so you can chop, slice, dice, mince various types of foods, worrying less about the cross-contamination risks. 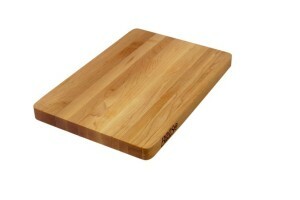 Wood doesn’t harbor bacteria so neither is this one; it is, in fact, a great alternative to the plastic cutting boards. Keep in mind to only hand wash it and oil it regularly for best results.